In talking recently to a SaaS colleague, I realized a core reason for my cloud passion: it’s all about the software. I came of age during the 1980s, which was in many ways the golden age of software. For the four previous decades - from the late 1940s academic computers to the minicomputers of the 1970s - the driving value proposition of technology was led by hardware. 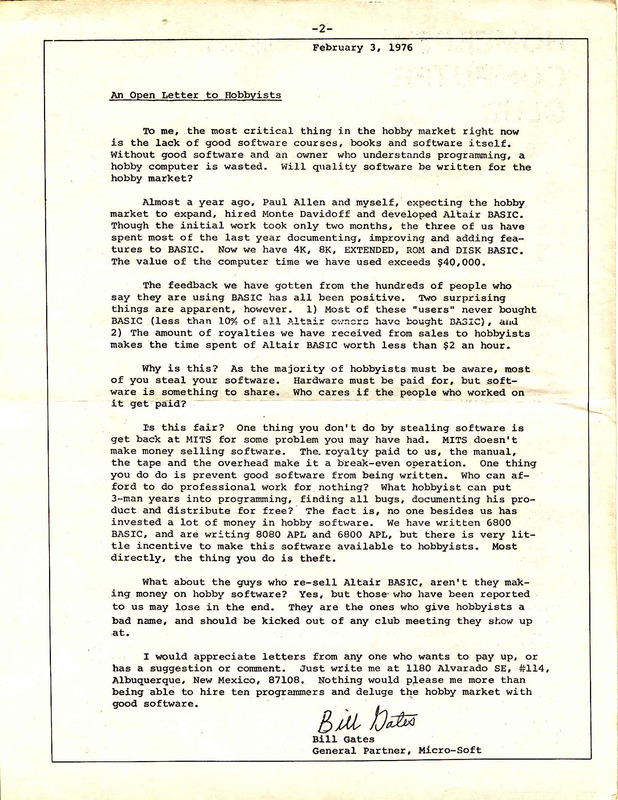 It wasn’t until the late 1970s with Microsoft that we saw the first experimentation with software as a business model (see Bill Gates letter to the Home Brew Computer Club). This software spark became an ember, and this ember quickly became a fire. The 1980s brought us our first large software companies, including Microsoft, Oracle, Lotus, and Novell. The golden age of software gradually gave way though to the dotcom boom of the 1990s, where we saw the resurgence of hardware in support of corporate data centers. This was the decade best remembered by the big box companies, including Cisco, Sun, Dell, and HP. The 1990s was followed by the decade of SaaS, in which companies like Google and Salesforce pioneered a new balance of power between hardware and software, with hardware just barely maintaining its edge. But with cloud computing in the late 2000s, we officially entered the second golden age of software. For the first time, we could run an entire business without having more than a laptop. What we previously co-located to data centers - servers, load balancers, firewalls, routers - was suddenly just an API call away. Hardware rapidly become commoditized through increased competition and overseas manufacturing, while simultaneously an incredible burst in software innovation occurred through open source. It’s hard to say where this second golden age of software will take us. It’s clear though that to sustain it, we will need to manage unparalleled complexity, with software capable of managing big data and leveraging on thousands of cores of compute. To achieve this, we will need increased innovation in the people, process and technology by which we build software. We will also need to reinvest in the pivot point upon which this golden age will turn: the software professional. So welcome to the second golden age of software. Next time you talk to someone building out data center infrastructure, you can say to yourself: don’t you get it yet? It’s about the software, stupid. Attribution to James Carville for shameless repurposing of his 1990s campaign slogan.